The 4th Vietnam International Electrical Technology & Equipment exhibition 2011 takes place from 7 - 10 September 2011 at Hanoi Interantional Centre for Exhibition (Hanoi I.C.E). Book Eternity hotel next-door for your most convenient accommodation during the event. FREE pick-up car/van airport - hotel for early bookings before 25 August and at least 3 nights staying with us on 5 - 12 September 2011. 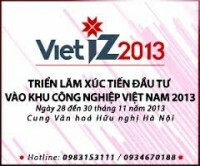 Welcome to the exhibition for investment promotion into Vietnam Industrial Zones 2013 (VietIZ 2013) - The organizer of the exhibition for investment promotion into Vietnam Industrial Zones 2013 (VietIZ 2013) would like to send you our best regards. Eternity Hotel welcome to VE Expo 2013 The Fifth International Exhibition & Conference on Vietnam Energy Development Nov 2013 .